At first it was thought the communists were withdrawing, they are not, and instead are making steady gains in the area around Danang. The real victims of war are the civilians. A bus was crowded with people when it hit a mine in the road. _-_ Wounded Vietnamese. 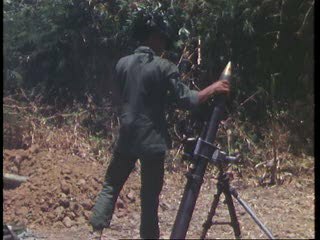 ARVN soldiers camouflaged, fighting, firing on hillside. Wounded mother and bleeding child. Wounded & refugees on the road. (Same day as Nixon's resignation, departure from White House.) _-_ Double system Pic & Track. _-_ _-_ This item consists of raw, unpackaged, news materials relating to the Communist advance on Da Nang. Chicago: “Vietnam: A Television History; Communists Advance Near Da Nang,” 08/09/1974, WGBH Media Library & Archives, accessed April 23, 2019, http://openvault.wgbh.org/catalog/V_C8E8C21D75204A4489A760D0EFF3C6C9. MLA: “Vietnam: A Television History; Communists Advance Near Da Nang.” 08/09/1974. WGBH Media Library & Archives. Web. April 23, 2019. <http://openvault.wgbh.org/catalog/V_C8E8C21D75204A4489A760D0EFF3C6C9>.